How many times have you tried to come up with a creative way to reuse toilet paper rolls, but ended up recycling them instead? 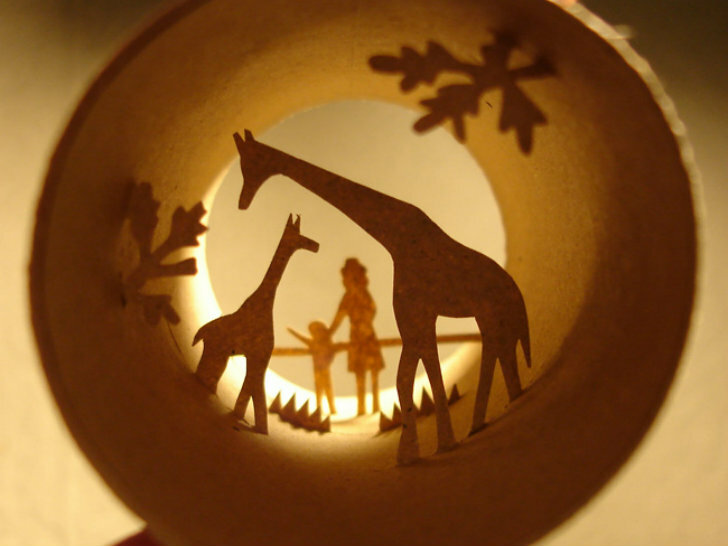 Well French artist Anastassia Elias figured out a way to transform old paper rolls into charming miniature worlds. From zoos to soccer games to beauty parlors to tango lessons, Elias' Rouleaux project features diorama-like depictions of sweet simple moments. When backlit with a simple light, the rolls become action scenes that you wish you could slip into yourself. Anastassia Elias is a painter, illustrator and collage artist and her Rouleaux dioramas showcase just one of her many talents. She creates tiny scenes inside the tubes by attaching paper cutouts to the side walls with glue and tweezers. The placement of her characters and objects creates a 3D scene and light travels through the tubes to create motion and shadow. “I cut the small paper shapes that I stick inside the toilet paper rolls,” explains Elias. “I use tweezers to manipulate the paper shapes. I select the paper of the same color as the roll. It gives the illusion that the paper figures make part of the roll. I need few hours to make one piece.” Her scenes run the gambit from family shopping, visiting the zoo, nature scenes, children playing, a grandma sleeping, painters painting, someone getting their hair done, a soccer game and even an exciting boxing match. These miniature works of art are so well crafted one could almost imagine stepping into them. Anastassia Elias is a painter, illustrator and a collage artist and her Rouleaux dioramas are just one of her many talents. 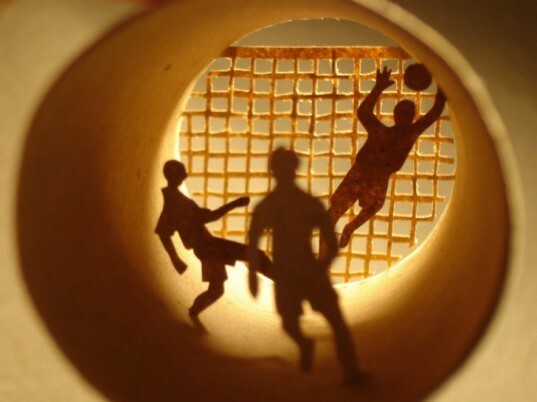 She creates tiny scenes inside the tube by attaching paper cutouts the side walls with glue and tweezers. The placement of her characters and objects creates a 3D scene and when lit up, light travels through the tube to create motion and shadow. As Elias says “I cut the small paper shapes that I stick inside the toilet paper rolls. " Her scenes run the gambit of a family shopping, visiting the zoo, nature scenes, children playing, a grandma sleeping, painters painting, someone getting their hair done, a soccer game and even an exciting boxing match. These miniature works or art are so well crafted one could almost imaging stepping into them, or at least a stop motion video.